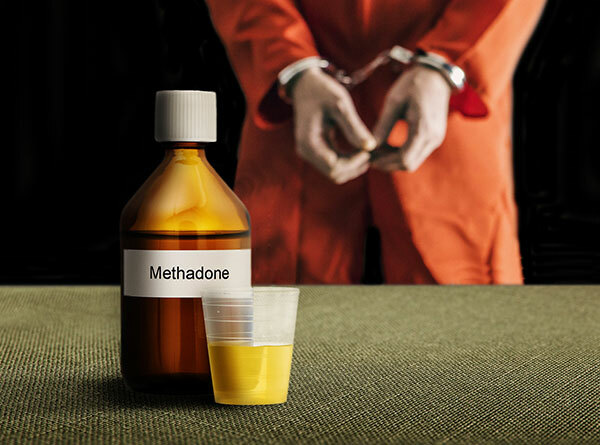 Those who received methadone during incarceration also reported less heroin use and had a lower risk of nonfatal overdose after being released. Many people who are incarcerated have opioid use disorder (OUD). Evidence suggests that methadone maintenance treatment (MMT) during incarceration can reduce prisoners’ risks of overdose and other short-term adverse outcomes after release, but few jails and prisons in the United States offer it. Dr. Lauren Brinkley-Rubinstein from the University of North Carolina School of Medicine and her colleagues recently reported that continued MMT during incarceration significantly improved engagement in treatment for OUD and reduced overdose risk for at least 12 months after release. "Hopefully, the results of this study will help persuade correctional administrators to implement medication-assisted treatment programs in their facilities," says Dr. Brinkley-Rubinstein. Figure 1. A Study Assessed the Effectiveness of Continued Methadone Maintenance Treatment in People Incarcerated in the Rhode Island Correctional System Participants who previously received MMT were randomly assigned to MMT or standard of care (forced, tapered withdrawal from methadone) during incarceration. The study included 179 individuals as they began incarceration at the Rhode Island Department of Corrections. All had been receiving MMT when they entered jail or prison, and all were to be incarcerated for 1 week to 6 months. About half of the participants received continued MMT; the others received the correctional system’s standard care of forced, tapered withdrawal from methadone (see Figure 1). The researchers followed the participants for 1 year after release, assessing continued MMT and other treatment participation as well as various drug-related outcomes. At 12 months after release, participants in the MMT group were slightly more likely to have resumed community MMT and to remain continuously engaged than those in the forced-withdrawal group. They also were slightly less likely to be re-incarcerated, present to an emergency department, use heroin, or report injection drug use. However, some participants with shorter incarceration times who were assigned to the forced-withdrawal group were still receiving methadone at the time of release, which may have narrowed differences between the groups. Even among participants who received methadone the day before release, only about 45 percent continued MMT long term, suggesting that other obstacles may have prevented treatment access in the community post-incarceration. Nevertheless, Dr. Brinkley-Rubinstein is optimistic about the potential of MMT during incarceration. She says, "This study provides even more evidence to the growing body of knowledge about the short-term and long-term positive impact of access to medication-assisted treatment during prison and jail." Figure 2. Methadone Maintenance Treatment (MMT) During Incarceration Improves Treatment Engagement and Drug-Related Outcomes Incarcerated people with OUD who received MMT the day before release were more likely than those who were off methadone to engage in continuous MMT post-incarceration and less likely to report heroin or injection drug use in the last 30 days or to have experienced a nonfatal overdose when interviewed 12 months after release (all p<0.05). This study was supported by NIH grants DA035692, DA037190, DA029201, and DA022112. Brinkley-Rubinstein, L., McKenzie, M., Macmadu, A., et al. A randomized, open-label trail of methadone continuation versus forced withdrawal in a combined U.S. prison and jail: findings at 12 months post-release. Drug and Alcohol Dependence. 184:57-63, 2018. NIDA. "Methadone Maintenance Treatment During Incarceration Has Long-Term Benefits." National Institute on Drug Abuse, 4 Apr. 2019, https://www.drugabuse.gov/news-events/nida-notes/2019/04/methadone-maintenance-treatment-during-incarceration-has-long-term-benefits. NIDA. Methadone Maintenance Treatment During Incarceration Has Long-Term Benefits. National Institute on Drug Abuse website. https://www.drugabuse.gov/news-events/nida-notes/2019/04/methadone-maintenance-treatment-during-incarceration-has-long-term-benefits. April 4, 2019.